1 Communist Party "intermediate form"
5 WIDF affiliated United States "Regional Workshops"
Women for Racial and Economic Equality' was a Communist Party USA front which is the U.S, affiliate of the Soviet-controlled Women's International Democratic Federation. In 2010, Angelo D'Angelo, Ed Wlody and Kevin Keating wrote a paper for consideration at the Communist Party USA's 29th National Convention, entitled "To Build Our Party — Rebuild Left and Intermediate Forms" calling for the re-establishment of party "intermediate forms". In the past, the Party helped to launch left and intermediary forms. Many will remember their initials: NAIMSAL (National Anti-imperialist Movement in Solidarity with African Liberation), WREE (Women for Racial and Economic Equality), TUAD (Trade Unionists for Action and Democracy), USPC (the US Peace Council, an affiliate of the World Peace Council), NAARPR (National Alliance Against Racist and Political Repression, "The Alliance") and others. 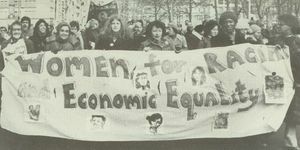 According to a short article in the CPUSA newspaper Daily World, Sept. 27, 1980, "Report on Women's Parley", WREE was sponsoring a meeting in New York City featuring "a report back, this Sunday, on the July United Nations Mid-Decade Women's Conference and Forum held in Copenhagen." Kay Camp - Women's International League for Peace and Freedomn , a CPUSA dominated "peace" organization affiliated with WIDF. Camp was a longtime leader of the Hanoi Lobby in the various Mobes and PCPJ. Blanche Shaw - Coalition of Labor Union Women , a leftist organization founded, in part, by the CPUSA and heavily influenced by them in the leadership structure at both the national and local levels. Karen Talbot - World Peace Council - ; longtime member of the CPUSA who functioned as one of their key international workers, along with Sandy Pollack, Abe Feinglass, Ernest DeMaio, and a few others. "The program will also feature poetry reading by Bernadine and dance performances by Beti Garcia and Ruth Kornesaroff. The meeting, organized by WREE, is set for Sept. 28 at 3 p.m. in the Green Room of 13 Astor Place (District 65 UAW District 65. A $2 contribution ($1 unemployed) is being asked." According to an article, "Plan award's dinner to honor activists", Daily World, Feb. 19, 1983, p. 4. "Women for Racial and Economic Equality WREE will honor civil rights activists Julia Wilder and Maggie Bozeman at its First Annual Fannie Lou Hammer Awards dinner on Saturday, February 26." "Ms. Bozeman and Ms. Wilder were unjustly convicted of vote fraud when they helped elderly people vote in Pickens County, Alabama. They were jailed but later released due to nationwide protests. Currently, ms. Wilder and Ms. Bozeman are on parole and denied the use of their voting rights..."
"Joing WREE will be city and state officials; leaders from civil rights organizations and liberation movement, and representatives from church and women's groups." Elombe Brath - of the Patrice Lumumba Coalition (i.e. a veteran marxist activist), will be among the participants." "For more information, call Norma Spector at 473-6111, or Loretta Benjamin at 477-3188." WIDF affiliated United States "Regional Workshops"
Goldstar Mother, Nydia Velasquez - "Congressista"
This page was last modified on 21 July 2018, at 13:23.